MERIAN -Vtrivsque Burgvndiae Tum Ducatus Tum Comitatus Descriptio. MERIAN, C. - Vtrivsque Burgvndiae Tum Ducatus Tum Comitatus Descriptio. Vtrivsque Burgvndiae Tum Ducatus Tum Comitatus Descriptio. - MERIAN, C.
Title : Vtrivsque Burgvndiae Tum Ducatus Tum Comitatus Descriptio..
Map maker : MERIAN, C.. Size : 12.2 x 15.0 inches. / 31.1 x 38.1 cm. 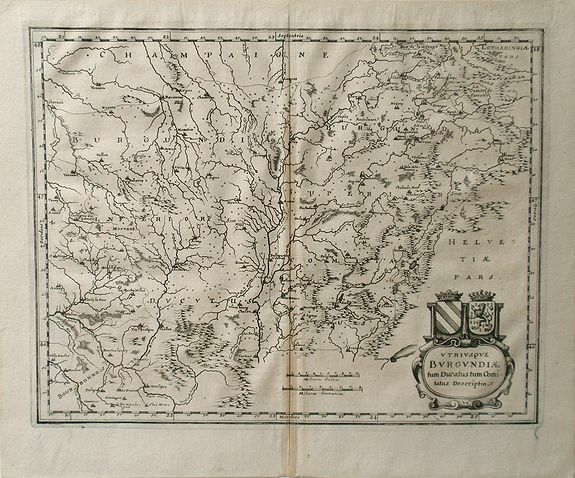 Description :Map of the Burgundy region of France by Casper Merian from his atlas Topographia Germaniae Inerioris. This wonderfully detailed map depicts major cities such as Toullon, Chalon and the Saone river. In the bottom right corner Geneva is shown. A cartouche illustrates heraldic crests, shields and crowns. Condition : Some light foxing, staining and creasing throughout. Green ink stain on bottom margin and some additional creasing along center fold. Some foxing and staining on verso and creasing along top and bottom margins.